Hello friends! I'm back with another card that was passed up for publication a while back. Actually, I suppose it was meant to be, because I wound up sending this to a good friend of ours who just lost his father. 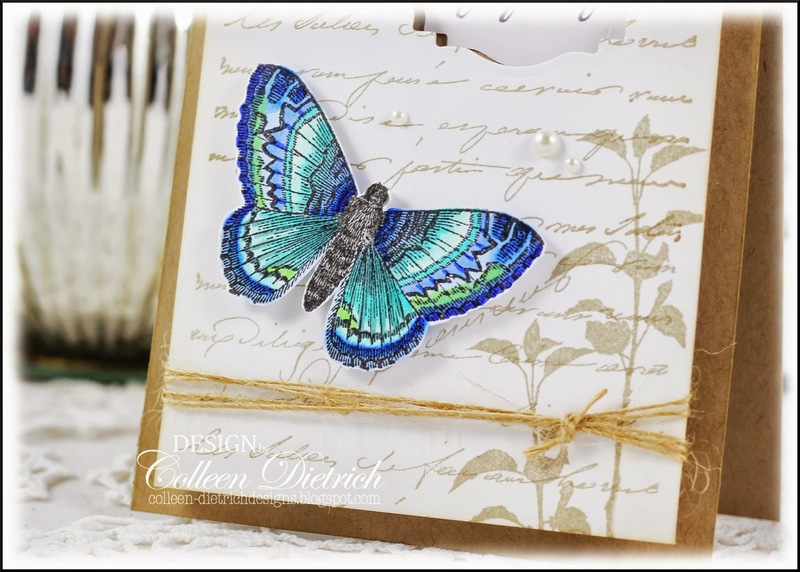 This beautiful blue butterfly is from the Lost Coast Designs set, Butterflies. I used a Labels Eighteen die to cut an opening in the stamped-script panel (Hero Arts Manuscript Background). 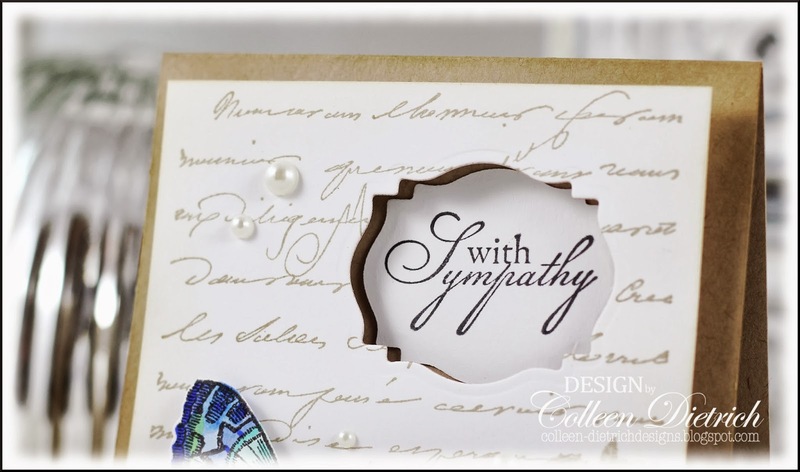 On the opposite side of the die cut, I stamped the sentiment and set it aside. After popping up the script panel, I laid the sentiment piece inside and secured to the card base. I'm so glad you dropped by today! Gorgeous butterfly and loving the negative space for the sentiment! Very classy card Colleen. Love that opening and the beautiful script stamping! What a beautiful butterfly. They're always so gorgeous on cards. Absolutely lovely card, Colleen. Beautiful card ! 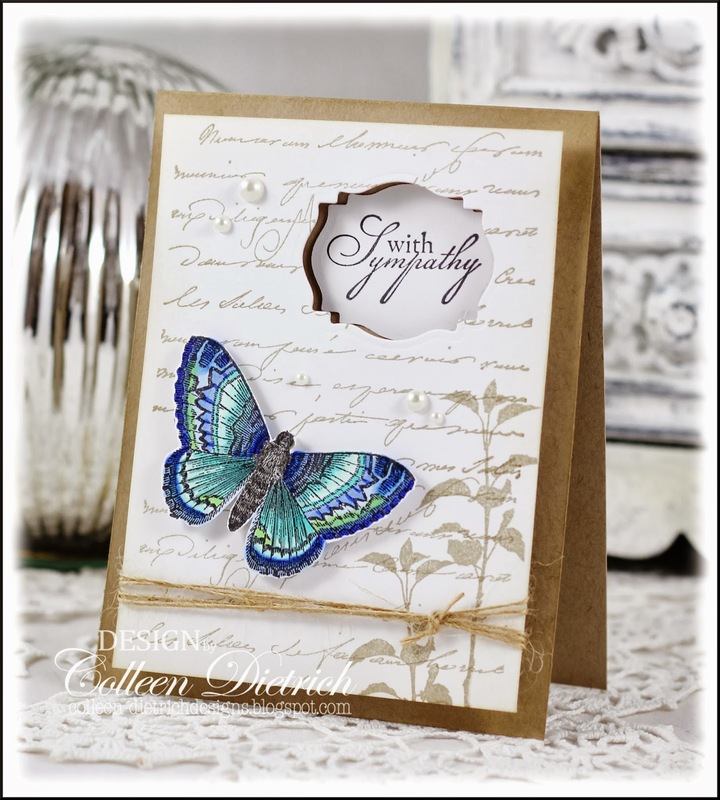 The bright blue butterfly stands out wonderfully on light colored bg ! This is so beautiful! I love that butterfly!!!! So sorry for your friends' loss Colleen. I'm sure she appreciated your beautiful card! Hope you're doing well and staying warm! I've been thinking about all of my east coast friends. We only have 1/2" of snow but WOW it's COLD!!! Colleen, this is such a beautiful bg and butterfly. I agree, this one was meant to comfort your friend. Beautiful butterfly...stands out brightly against bg...Pretty!!! This is breath-taking, Colleen! The butterfly is stunning. Gorgeous! love the negative space for the sentiment! I can't believe it was passed by and not published! Beautiful card and the butterfly is stunning--super coloring. What a beauty, I love the AMAZING butterfly and of course the layout!! What a beautiful butterfly! gorgeous card too! Love this cut out card! Another pretty butterfly on a gorgeous card! So soft and elegant...well done, Colleen! Talk About A Quick Birthday Card! The Cutest Apple for Valentine's Day!